A glimpse at the exquisite detailing in Louis Vuitton’s fall/winter 2018 collection reveals the painstaking handiwork of the artisans who make the brand synonymous with quality craftsmanship. With its fantasy spaceship set on an old horse courtyard at the Louvre, Louis Vuitton’s fall/winter 2018 runway show felt like something out of the Star Wars saga, but the hands behind the collection were definitively human. Beyond the space-suit shoulders and neoprene fabrics that fed the futuristic theme, most pieces were balanced by old-school tailoring. 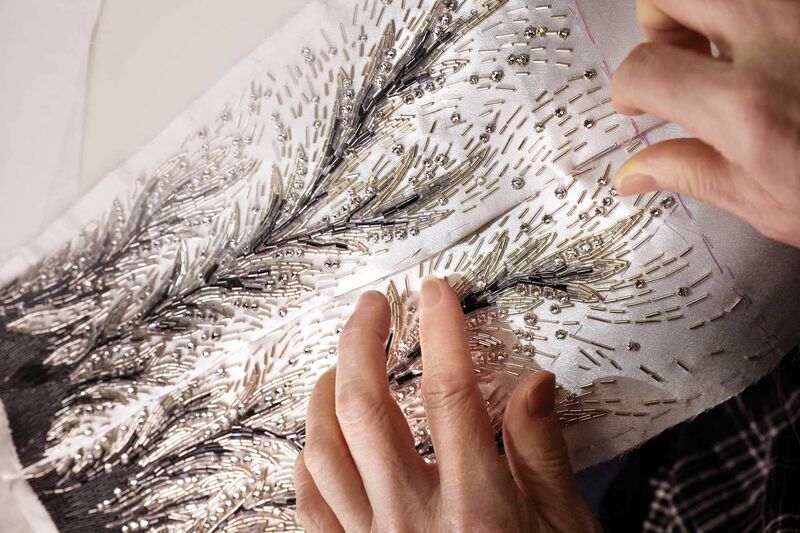 A Louis Vuitton artisan embroiders fabric with the hook and needle technique. This melding of modern and classic has long been a mark of the French fashion house, and especially so since Nicolas Ghesquière took the helm as artistic director. The juxtaposition was embodied this season by a beautiful bustier crocheted by hand to make a precise waterfall pattern. The precise, intricate beadwork formed an organised asymmetry of patterns, clearly demonstrating there are some things that can only be done by hand. Given Louis Vuitton’s history as a maker of leather trunks, it would be hard to ignore the latest leather accessories. As well as the classic flat purses rebelliously held sideways, the shoes that walked the runway were works of art in their own right. One of the opening stunners is made of white ostrich leather, with the shape hand-cut before each dot was hand-painted and python leather was added over the heel. After the delicate black leather arch is assembled, the gold harness detail is added. In contrast to the heavy-duty Archlight sneakers of seasons past, this ladylike shoe with equestrian detailing not only played to the 19th-century setting, but was a reminder of LV’s reverence for craftsmanship no matter how much it embraces modernity.